As the market for top talent becomes more competitive, how you market your organization to candidates is critical. The best talent always does their research on organizations before they apply. Make sure you are highlighting your culture and employer brand to get more applicants that are the right fit for your organization. 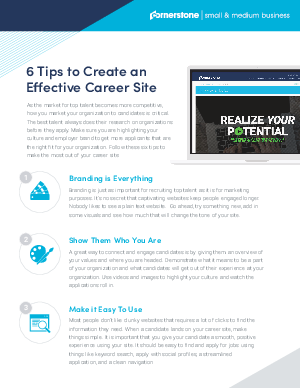 Follow these six tips to make the most out of your career site.